As you age, it is normal to begin to notice tooth discoloration. However, the rate and severity of discoloration is impacted by several factors, such as lifestyle habits, foods and drinks, and poor oral hygiene. When your smile starts to dull, many turn to over-the-counter whitening treatments to regain their confidence. However, these products are ineffective. 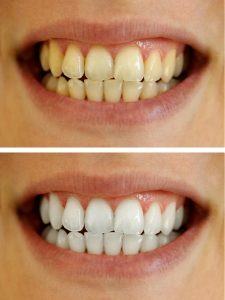 To gain drastic results that last, you need professional teeth whitening in Springfield. At Olson Family Dental, we use the Zoom! Whitening System to reverse tooth discoloration for a bright, white smile. The Zoom! Teeth Whitening system is the most preferred whitening system because it produces fast results that last. We offer two different options to whiten your smile with Zoom! Whitening. Our in-office treatment can get your teeth several shades whiter in just one appointment. We use a safe and effective whitening agent that is 15 to 35 percent carbamide peroxide to deeply penetrate the enamel to resolve tough stains. During the treatment, we will apply a rubber dam around your gums to protect them from irritation. Then, we will apply the professional-grade whitening gel to the teeth. The gel is then activated by a special light. The light will remain in place for about 15 minutes. During your treatment, you will undergo three sessions to walk out with a dazzling white smile. In addition to our in-office treatment, we also offer an at-home kit. Our at-home kit consists of custom-made whitening trays to ensure comfort and even distribution of the whitening gel. The gel is 10 percent carbamide peroxide to whiten your teeth at home and around your own schedule. You will wear the trays daily for 15 to 30 minutes. In about two weeks, you will have a bright new smile. After you use a whitening treatment, we recommend you do not eat or drink anything that can cause tooth discoloration to protect your new white smile. This is especially important immediately after the treatment as your teeth will be more prone to staining. Some tooth sensitivity may occur. As a result, you may want to avoid foods and drinks that are hot or cold. Any tooth sensitivity you experience will dissipate within a few days. To continue to protect your new white smile, brush your teeth twice a day, floss daily, and visit your Springfield dentist twice a year for a cleaning and checkup. While teeth whitening is safe and effective, it is not right for everyone. Prior to undergoing a whitening treatment, you will require a consultation with the dentist. If you have receding gum lines or exposed root surfaces, teeth whitening may not be right for you. After performing a thorough consultation, Dr. Olson will determine the best course of treatment to remove your tooth discoloration. If you are ready for a bright, confident smile, it is time to choose professional teeth whitening. The Zoom! Teeth Whitening system will produce lasting results for an attractive smile.